James Mulrooney and Aaron Maddock battle for possession. CONOR MCDONALD SCORED 1-6 as Wexford secured to promotion into the top tier of the NHL with victory over Offaly at O’Connor Park in Tullamore. Wexford knew coming into the game that a win would assure of them Division 1A hurling for the first time since 2011 and their revival under Davy Fitzgerald continues. The visitors held a 1-7 to 0-8 lead at half time, despite playing against a strong breeze in the opening half and Mark Fanning saved a Shane Dooley penalty after the break. Wexford hit the first two points of the game with David Redmond and Paul Morris on target inside three minutes. But Offaly were coming off the back of three defeats in a row and they needed to start well with the breeze behind them. Offaly scored the next four points with Dooley (twice), Sean Cleary and Stephen Quirke amongst the scores. Wexford went back in front, 0-5 to 0-4 in the 17th minute, when Morris landed his second point of the game. But Offaly replied with a Cleary double and another Dooley point. The signs were promising for the hosts, but they conceded 1-2 before the break. McDonald’s goal came in the 34th minute, when he caught Aaron Maddock’s delivery and rifled a low shot into the bottom corner of James Dempsey’s net. Dooley tagged on another free before the end of the half, but Offaly trailed by two points at half time. Dooley hit another free at the beginning of the second half, but his penalty was saved by Fanning in the 49th minute and that was the difference in the end. Scorers for Wexford: C McDonald 1-6 (0-4f), P Morris 0-2, D O’Keefe 0-2, A Nolan 0-2, J O’Connor 0-1, D Redmond 0-1, L Chin 0-1, H Kehoe 0-1, D Dunne 0-1. Scorers for Offaly: S Dooley 0-10 (0-8f, 0-1 ’65), S Cleary 0-3, S Quirke 0-1, O Kelly 0-1. Email “Wexford clinch Division 1A promotion with fourth straight win in Tullamore ”. 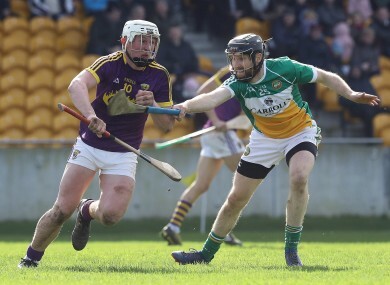 Feedback on “Wexford clinch Division 1A promotion with fourth straight win in Tullamore ”.